Finally (thanks to Caroline!) I think I've found it — Built by Wendy's Sew U.
I’d been contemplating prebuying this on amazon, but I wasn’t sure what the 3 included patterns were! Could you pretty please tell us a bit about the three patterns? Are they the same as her other commercially available patterns or unique to the book?Thanks so much! Hmmph. By the time I got to the last paragraph, you had convinced me to buy the book. THEN I read about the patterns only going up to 38 1/2. Fuggedaboutit! Even my 25-yr-old DD has a larger bust than that.Hmmph, I say again! http://www.builtbywendy.com/onlineshop/cart.php?target=main&page=builtbyyouI think the shirt and pants pattern are the same as in the link above, and there’s a simple A-line skirt pattern, too. Another great one is the old “Reader’s Digest Guide to Sewing.” I bought a used 1983 copy online for $1.49 plus shipping, and use it almost every day. It’s better than most of my fashion design textbooks, and is invaluable for those pesky little steps on things you know you should remember professional treatments for, but don’t; like understitching, bagging a lining, and how to padstitch a tailored lapel. Thanks for the recommendation, i think i’ll tell everyone at school about it today! Funny, I just bought that book this weekend! And I work in a library, so I NEVER buy books; but our local indie bookstore had a Labor Day sale…plus, I DO buy patterns, and with the three patterns I figured it was a good splurge.I also LOVE the cookbooky approach, because I almost never cook/knit/sew anything exactly according to the recipe. There are a lot of nice little tips in this book, as well as some good instructions (e.g. zipper insertion). It’s definitely a good “basics” book, neither overwhelming nor dippy (I love how she empowers the reader to do things like add piping, which always seems scary to me). I may even try to sew the pants!!! (though they look a little too low-rise for my taste…has anyone out there tried them?) I do really think the sizing of the patterns should be clear on the outside of the book, too; and that it’s a shame they don’t come bigger.The other pattern-alteration book I’m into right now (I checked ALL of them out from the library) is “Fit for Real People” by Palmer and Alto. It’s more altering-to-fit, not altering-for-style, but they do encourage the latter somewhat as well; e.g. a pretty great and CLEAR section on how to move darts around. And they walk through alterations for very different body types/sizes in this book, with no judgement, which is great. As has been said, alot of us larger ladies sew, since what we want simply can’t be had in ready to wear. So it is a real pity that another book for small ladies has come out that doesn’t include us larger market. We do have disposable income. We have money to spend — but again, I will spend it elsewhere. I saw an ad for this book in the current issue of BUST, but haven’t had time to look for it yet.Glad to see Erin’s and Nora’s comments on this. Looks like something I would be happy to flip through at the book store or library, but I don’t know that it could surpass Fit for Real People for alteration instructions or my old Vogue books for sewing and style info. Thanks you! I think I may have to give myself this as a birthday present. Anonymous at 3:54 p.m., if you don’t already have it, I strongly suggest you buy “Fit for Real People” by Palmer and Alto. The alterations truly are for people of all ages and sizes. I have it, and plan to get “Pants for Real People” and “Jackets for Real People,” also by Palmer and Alto. I have, in the course of a chequered career, sewn for people with some remarkably diverse shapes, and if you were going to limit your sewing bookshelf, I’d strongly recommend that the Palmer/Alto “Fit for Real People” series belongs on that shelf. I collect sewing books (in addition to fabric and patterns), and the Palmer/Alto are among the best and most realistic in their attitude, approach and instructions. One of the more useful pieces of information they offer is the order in which alterations should be made – because, of course, once one area is altered, it often affects the fit of other areas, and it’s important to fit different areas in the correct sequence; otherwise you could wind up with a great big mess on your hands, instead of a well-fitting garment. The book sounds great but I want that tote. I could sew it, I suppose…..
Carrie K – or you could do what I did, which is go to Home Depot and buy it – I actually got two different sizes, on a two-for-one sale. As I recall, the canvas on my carryalls is dark, not light, but those canvas tool carryalls can be had at places-where-tools-are-sold (Home Depot, probably Lowe’s, maybe Ace, maybe whatever is local to you). Perfection! 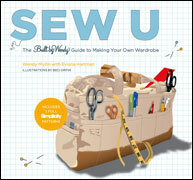 I’ve been reading this site for a while and am often inspired to start sewing…but it’s just too darn intimidating. This book might be able to water things down and get me going! Thank you, Erin, and everyone else who shared a book they use and love. Keep it coming! I bought the book yesterday and I LOVE it. I got a hand-me-down sewing box that I’ve been working on gathering my necessary tools into and I’m going to make a skirt with a piece of muslin I had laying around this week. So, I’m still excited about the book and all BUT… I didn’t heed your warning about the sizing of the patterns. Specifically the shirt. Um, I’m only about, oh, TEN inches bustier than the shirt allows for. Sigh. I guess I’ll just be making skirts and pants. I can always learn to sew the shirt for my daughter’s size instead of mine.But, I still love the book.